Back at E3 2009, one of the highlights of Sony’s press conference was when Jack Tretton, President and CEO of SCEA, took the stage to announce that Rockstar North was developing a new PS3 exclusive called Agent. And… that’s about the last we heard of the game. Unfortunately, it looks like we’re going to be waiting even longer. Two years and two E3s have already passed since that announcement. It looks like two more years will pass before the game ever releases – if ever at all. Although Take Two said the sandbox-style Agent was still in development exclusively on the PS3, there hasn’t been as much as a peep detailing the game; no screenshots, trailers or other media, either. That’s not a good sign. 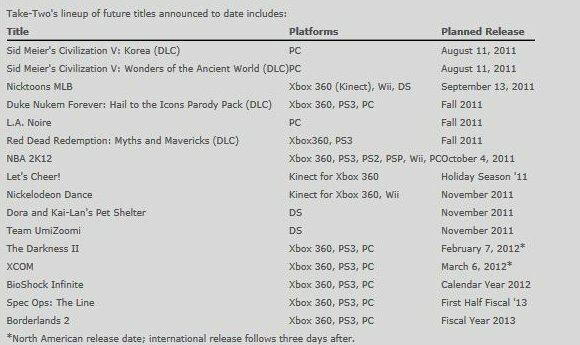 Even worse, Take Two just revealed their upcoming release line-up stretching as far as fiscal year 2013. Agent, sadly, is nowhere in sight (see below).